Cut the zucchinis in half lengthwise. If necessary, trim a little off the bottom so it will sit still in a baking dish. With a spoon, scoop out some of the center where the seeds are to make a little groove in the zucchini boats. Place zucchini in a baking dish and brush the boats with olive oil, spread the minced garlic and add salt and pepper to taste. Arrange the halved tomatoes on the boats and sprinkle with bread crumbs. Remove from oven, turn on the broiler, place mozzarella and basil in between the tomatoes, and put them back in the oven to broil for a few minutes until golden and bubbling. Remove from the oven and sprinkle on some parmesan cheese. 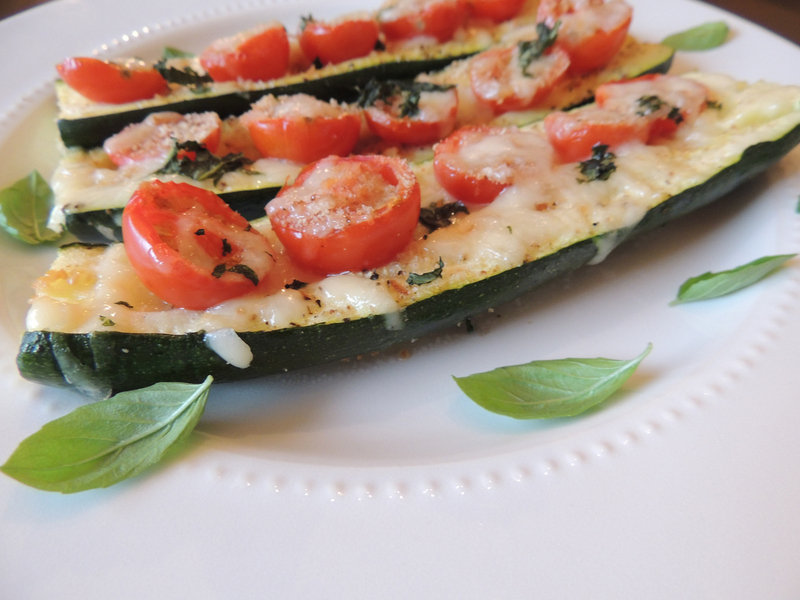 Crispy zucchini topped with garlic, cheese, tomatoes and basil, and then baked until golden and bubbling with cheesy goodness.